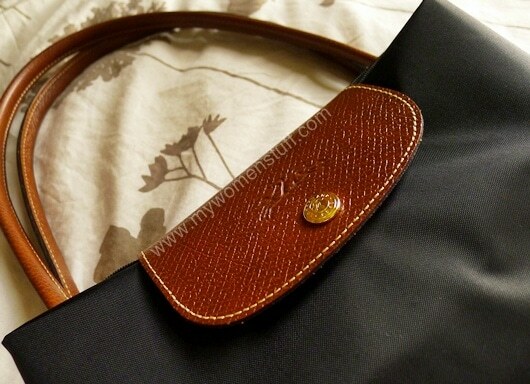 Home » Fashion » Bags » The Longchamp Le Pliage : Yes I got it and it travels very well for work! The Longchamp Le Pliage : Yes I got it and it travels very well for work! Golly me! When I asked you about the Longchamp Le Pliage tote, so many people responded with their love (and hate) for the Longchamp Le Pliage, I had to eventually find out for myself how I felt about it. No better way that to work it out for yourself you know 🙂 And no better way to tell you my thoughts than at the beginning of a brand new year! I know I expressed my love for the Herve Chapelier 925N tote for travel but during a work trip out of town, I came to realize that the Le Pliage is more work travel friendly. The colour I chose for my Le Pliage is black. Mostly it was for practicality and because there were only 3 colours available and black was best. I’m glad I went for black though. Boring as the colour might be, it does double duty better for work and travel. The size I chose (Medium) fits a ton. For the plane, it comfortably held my makeup pouch, shawl, flight and hotel bookings, documents, a book, gadget pouch with iPod and phone and other miscellany. I don’t regret buying the Longchamp Le Pliage tote though. I realize that many people are put off by it being “done to death” here in Asia, but since I’m not using it as a “status symbol” (it hardly is!) I’m happy and comfortable with it as a bag I can bash around. I particularly like using it for when I travel for work. I don’t like carrying my good leather bags when I go out of town but I can’t be toting a colorful fun bag that looks like it belongs on the beach, either, what with having to attend meetings and having to project a serious image and all 😛 The Le Pliage isn’t the most serious of bags, but it does its job well enough in the boardroom. But if I were travelling for fun, I’d still use my Herve Chapelier. The broad straps sit better on my shoulders without cutting and it does not feel as heavy. As to why I did not consider the Le Pliage with the short strap? The reason is simply because when I travel or when I’m out and about (which is when I’d use the bag) I like to keep my hands free and the short strap was strictly to be hand held or arm carry only. I could fit it over my shoulder but it would be a bit of a squeeze once I get all my stuff in there. PREVIOUS POST: Happy New Year 2011! Are you up for a little challenge? I must admit it is a very useful bag but be careful of the 4 base corners of the bag. The material frays easily even with minimum usage. i have to agree that it is quite ‘serious’ looking and can hold a whale in it. i am still yet to find a ‘serious’ looking sling bag (like le sportsac kind), then can bring to work and fun but it’s light n easy to wash kind. any recco? A whale might be a bit of a tight squeeze… but then I didn’t get the largest on offer either! 😉 I love Lesportsac messenger bags but as you have mentioned, they aren’t quite work friendly. Actually, unless its leather, its not easy to get away with messenger bags for work (unless you are a messenger boy) because they do tend to be too casual. But then again, it depends on how formal your work place is. At some offices, you could easily get away with some of the more sombre Lesportsac designs 🙂 I’d suggest Kipling, but I don’t own any and it looks even more casual. Congrats! I own two myself (in the large size). 😀 You may want to consider getting (or making if you’re the DIY type) a base shaper so that it holds its shape at the bottom. I got mine on eBay. Thanks for the tip! I didn’t have a problem with the sagging coz it was stuffed full anyway 😀 Do you have a short handle and do you know how it compares in terms of carriage? Mine has a long handle so I don’t know how the short handles are. Bought one recently, i agreed that the handle strap does not fit well on the shoulder and drop often but apart from this, it’s a very lightweight bag and does not fell heavy on the shoulder when carry lots of stuff. I bought one and considered my first one during my recent trip to UK. Cost me around 56pound for the medium short handle. LOVE IT TO DEATH. Simply because my life revolves around with books and im a fulltime law student. I fly back and forth between east malaysia and singapore. 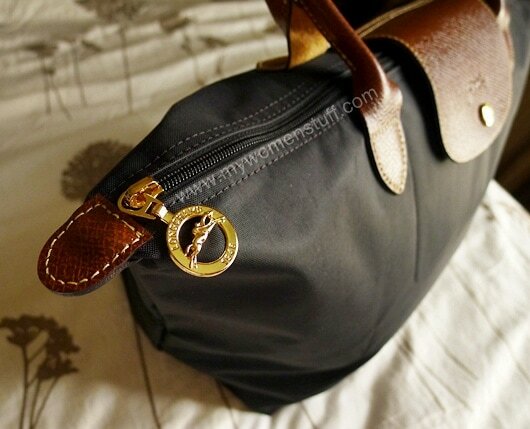 And longchamp is the best for travelling, best for school bag, book bag etc. I’ve been using it for 5months now, so far so good. No fraying at the corner of the base etc. I notice that happens to few of my friends’. Oh well. I guess for those of us who don’t see this bag as a “status symbol” its easy to see it for its practicality. I love the look of the chocolate colour. Its so rich and pretty! The short handled one has a younger feel to it 😉 Or the smaller version which also fits quite a lot of stuff. Oh dear with corners fraying, its quite something to think about since it can get expensive over here. How long have you had yours? I have the exact same thing but in taupe. Besides loving the size and the long strap (i love going hands free too) ,I love the color to bits as well. It’s quite a unique chocolatey brown with a hint of green at closer look. Neutral and safe colour suited for almost all occasions. I might very well get another one too. I wanted to get Taupe!! But I wasn’t sure how it’d hold up with being stuffed under airplane seats and being tossed about and all. Does yours get dirtyand if so how do you clean it? I read they can be washed despite the leather but I’m not sure. So far so good. Stuffed under airplane seats etc is ok i guess. The color is still quite dark so I don’t see dirt unless it is really very dirty. The other day, someone stained my bag with a bright marker (seems to me) and i didn’t have the time to wash out the stain til 2 weeks later. After rubbing some ah yuan laundry soap on it, i brushed out the stain with an old toothbrush. Now it looks as good as new. No colour fading or whatsoever. When washing, i avoid washing the leather part. Handwashed. HAHA It gets addictive huh? 😛 I saw yours in your Style pic 😀 Nice one! Got mine medium size,short handle in orangy red. This is without the zip, just like ur Prada bag and I felt kinda insecure without the zip…:-( thou there is still the leather zap on top and it is kinda deep too…. i love mine too but u’ll definitely need a smaller bag organiser as well. Cos it’s hell trying to look for anything inside that bag! especially car keys!!! Thanks for the tip! Everyone says so and yes its a mess in there. Since I use mine mostly for travel, there’s less for me to organize, but I’ll be sure to tuck a bag organizer or pouches in there if I plan to carry small items like keys! anyways i just bought a purple planetes, medium short handle. if you’re looking for one that is practical but also stylish to bring to work, i’d suggest planetes. Can someone please tell me how much is it?How much is the long handle one, medium size? and where can i buy it in KL? Thanks! There is a Longchamp boutique at The Gardens, Midvalley and Pavilion KL. Local prices unknown. Paris, where did you buy yours? if its cheaper online, where can i purchase an authentic one?! Well, I didn’t see this blog until today, if you have yet to find one, alternatively is to get if from Bangkok airport, it’s appx 30 to 35% cheaper than the selling price in KL, colors selection could be limited, but black, navy & chocolate are always available. I hv help friends to purchase from BKK airport last Sep but now I know Schiphol airport is much cheaper by another 30 to 40%, in total it’s appx 60% cheaper … unbelievable, MY is definitely over priced. If you have friends work with airline, get them to purchase … cabin crew are entitled to another 5 to 10% depends on airport. Also available in Isetan KLCC. Currently the long handled medium retails for around RM530.00 :). Unfortunately not that much cheaper in Singapore. Le Pliages never go on sale as it’s one of their classics. coolie 🙂 my mom got two already, she really loves it and it makes me love them now. my mom’s friend is going to London next month or March, im going to ask her to help me to get one. but i have to give her the model no, anyone her know where to get the no? i want to get one of it, can anyone tell me where to get it in singapore? i will like to buy it in the shop rather tnan on-line. I have a medium short handle in Parline where I use for travel, it’s roomy enuf to fit DSLR, I also have a Cabas in Graphite for daily use, ordered both from US with my name embroidered, both Le Pliage has always the attention because of the embroidery… recently I was on work trip to Netherland and purchase summer colors at Schiphol airport for my collegues, they love it, I hv also rewarded myself with another Cabas in Red, since it’s so much cheaper @ Schiphol, I just couldn’t resist to get another ! Hi, I just wanna share with you my experience with the longchamp le pliage. I recently bought one early this year. Mine is a long handle medium tote in graphite, after 2 months of continuous use i realized the bottom corners of my longchamp are fraying. After searching through the net I realized many experienced this problem too. After that, I came up with a solution, I applied clear nail polish to prevent it from fraying. Voila, that does it, I no longer have this problem. Hope I helped. Thanks for the tip WyYee Chan! I recently bought Le Pliage long handle tote from the LM (Longchamp Maroquinerie) line in black. As much as I like the design of LM line, I’d prefer a bag that is more structured such as the Planetes line. The Planetes will hold its shape (just a bit) due to its thick canvas. However, the salesperson told me that LM tote is better because it is absolutely water-proof and stain-proof. However, the material inside is cotton fabric in chocolate colour, unlike the normal Le Pliage which is polyamide fabric either in black or white depending on the colour of the tote. Any thought on these 2 lines – LM and Planetes?